What's broadband tethering? Generally speaking, when you tether two things together, you create an attachment between them. 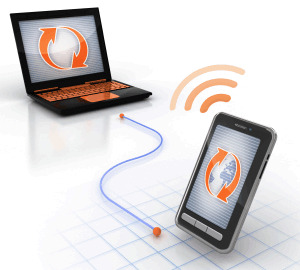 In the world of wireless broadband you're connecting your cellular phone with your computer or other Internet capable device like a tablet computer. So why would you want this feature? Well, it allows you to get Internet access using a smartphone rather than requiring you to purchase another wireless broadband modem. This can be a tremendous convenience, as well as a cost savings! 1. Use a USB cable to connect your smartphone directly to your device (usually a desktop or laptop). This is becoming a pretty old-school approach, however, is still an option. 2. Use WiFi by turning your phone into a Mobile Hotspot. This is the more popular, and convenient way to connect. As noted, you avoid having to buy a separate Internet device for all of your computers or Internet-capable gadgets. If you use the WiFi Hotspot approach, you can connect multiple devices simultaneously. Carriers offer it as an add-on to your existing wireless plan, which is almost always less expensive than buying a MiFi modem or other mobile broadband device and paying for a separate plan. Some carriers even offer it as a free feature, particularly on their higher priced plans. You have your phone and modem in one device, so you don't have to think about carrying around a separate modem or charging a separate hotspot device. You may experience slightly slower speeds than a dedicated modem depending on the connectivity you have between your computer (or Internet connected device) and your smartphone. Though, I wouldn't consider this to be a huge barrier to a decision, and I've heard people report to me that the speed they experience is fantastic. My personal experience with it is that the speed is very comparable to a dedicated MiFi device. Your phone battery will drain MUCH faster, particularly if you're streaming content for any period of time, and certainly if you're using it as a WiFi hotspot. In other words, you'll always need to consider where you're going to plug in your phone while you're using it. I know this to be a fact from personal experience. While you can see phone calls coming in, you won't be able to talk while tethering. That said, this largely depends on the network technology your wireless carrier is using, as well as your phone's capability to enable the hotspot function while on a phone call. Most modern phones can now handle simultaneous voice and data, however, your carrier needs to also support it, even if your hardware is fully capable. Definitely a feature worth investigating when shopping around. Don't forget that tethering consumes wireless data. Most carriers simply apply the data you use with this connection to your overall plan data bucket. This seems to makes the most sense and is the simplest approach. However, you'll want to ensure that you have an appropriate data allowance (i.e. bucket of data) when you start to tether. Fortunately for prepaid users, you won't ever have to worry about insane data overage charges! That said, you could find yourself out of high speed data in a given month if you don't have an appropriate data plan for your usage level. So how do you get it through normal channels? You'll need to check with your wireless provider to see if they offer an add-on. Also, note that even if they have that option, you'll have to have a phone that supports it; not all phones will allow you to tether. Fortunately, for those of you who do not want to sign a contract, below you'll find a table listing the prepaid wireless carriers that have no contract tethering options available! Note that some carriers call it Tethering, while others call it Mobile Hotspot. Available only on specified Android phones. Included with all eligible devices. Included in Simple Choice Prepaid & Simple Prepaid plans. Included only in $50 & $70 plans.